I've been waiting for this book for three years. 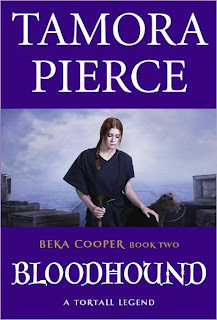 I loved Terrier--the first book in Tamora Pierce's Beka Cooper trilogy and I looked forward to spending more time in her company. I've been a Pierce fan for a long time now and with this series it was literally like coming home being back in Corus, the capital of Tortall. It was also a nice change of pace to have the story set a few hundred years before Alanna's time, and revolve firmly around the lower classes. Unlike Alanna's day, Beka's Tortall is a place where lady knights roam the countryside freely and girls can grow up to be part of the city guard if they want. That is exactly what Beka's always wanted and, thanks to the Lord Provost's benevolence, she's able to escape the city slums and help support her mother and siblings on a Dog's salary. In Bloodhound Beka finds herself characteristically partnerless. When one of the senior Dogs is laid up after a riot, Beka is temporarily partnered with her idol Goodwin and the two of them are sent to Port Caynn to run down the source behind a forgery ring that's been pouring silver plated copper "coles" into circulation throughout the realm. Transplanted out of her natural habitat, Beka is literally forced to step far, far outside her comfort zone in order to pass herself off as a flighty Dog who slides by on others' coattails and uses her womanly wiles to take credit for others' successes. Pretty much the polar opposite of her reserved, forthright, and honor-bound self. Going about her task with her standard single-mindedness, she doesn't expect to meet a young gambler who takes a romantic interest in her. She doesn't expect a mad Rogue who lets her people suffer and spends their takings. And she doesn't expect to be left alone. Bloodhound weighs in at over 550 pages and the entire story is told through Beka's painstaking journal entries. This is a very interesting (at times problematic) installment and not at all what I was expecting. The majority of the story simply follows Beka's daily movements as she prowls through Port Caynn, inserts herself into the underworld, and struggles with her growing isolation and strong need for companionship despite her at times overwhelming natural reticence. I missed Beka's circle of friends at home in Corus as they were absent the majority of the time. I missed Rosto and his prickly friendship with Beka, the way they stretch and counter each other. I found myself painfully uneasy as I watched Beka grow closer to the gambler/bank messenger Dale Rowan. In fact, I longed to step in and help Beka throughout this book. She is an amazingly strong character and I love her. I just wish she didn't have to stumble and fall sometimes. And I wish she didn't have to experience some of the pain she did. She deserves better and she can't seem to see a few very important things. Also, Pierce seemed to lose her way a bit and her usual strengths as a writer seemed oddly absent. At the same time I can be grown up about these things (honest I can) and recognize that perhaps they were necessary and be okay with that. I was underwhelmed with this story but remain very excited to read the third and final book in the trilogy--Mastiff--due out sometime next year. Knock on wood.